Installs to standard 1/2" shower arms. 2.0 gpm flow rate. Adjustable Spray. Installs to standard 1/2" shower arm. 2.5 GPM flow rate. Constructed of durable plastic. 1/2" IPS connection. 2.5 GPM. Handheld shower for tub spouts, easy installation with no tools required, 42" vinyl hose. Ideal for cleaning tub, bathing children and washing pets. The adjustable head allows for a personalized shower experience. 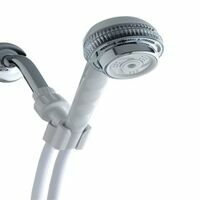 It is designed to fit 1/2" IPS connection and is easy to install for your indoor or outdoor showers. The chrome finish provides a clean appearance and it is constructed of a durable plastic. 2.0 GPM flow rate. Solid brass, U S made shower head provides invigorating high velocity shower spray using only 1.5 gallons per minute. Pressure compensating flow regulator insures a good shower flow even in lower water pressure areas. Standard 1/2" female connection installs easily on any standard shower arm. Available with or without push button trickle valve for greater savings while lathering, etc. Chrome plated. Adjustable Spray. Installs to standard 1/2" shower arm. 2.5 GPM flow rate. 2.0 GPM max. White shower with chrome plated brass connector & ball. 4 spray settings: wide spray, fast pulsating jets, spray and pulse, and pause (trickle). 2.0 GPM flow rate. All purpose spray attachment adapts to most sink spouts. Rubber, slip on connector. Bagged. Water-amplifying shower head, patented water and energy savings technology, increased water droplet size, fuller spray coverage, greater heat retention, 36 percent water savings, operates at 1.6 gpm. Blister packaging. Solid brass, U S made shower head provides invigorating high velocity shower spray using only 1.5 gallons per minute. Pressure compensating flow regulator insures a good shower flow even in lower water pressure areas. Standard 1/2" female connection installs easily on any standard shower arm. Available with or without push button trickle valve for greater savings while lathering, etc. Chrome plated. 2.0 GPM. The five spray massage shower head offers all the benefits of a standard shower head with the extra benefits of saving money on water and energy. 3-1/2" round shower head. 3 modes: full body coverage, concentrated center spray/massage, full body/massage combination, Features spray control ring, easy clean nozzles, removable flow regulator. Lever handle adjustment. Brass ball. Installs to standard 1/2" shower arms. 2.5 GPM flow rate. Four personalized shower settings: Pulse - steady pulsating spray. Turbo Pulse - powerful hyper massage. Spray Pulse - pulsating massage. Outside Spray - soft, body spray. 60 spray channels. Up to 2800 pulses per minute at 80 PSI. Original SaverShower design - provides invigorating wet feeling spray. Uses 2.2 GPM at normal pressure (50 psi), 2.5 GPM Max at 80 psi. Great for low pressure areas. Solid brass construction, chrome plated, all brass parts machined, plated and assembled in the U.S. Includes alternate spray disc for low pressure areas and is satisfaction guaranteed to the consumer. Installs easily with standard 1/2" female threads. 4 mode showerhead with 60 spray channels. Full body spray and coverage. Fast/slow massaging pulse, and combo massage and pulse. 5-spray/massaging shower head, with anti-clog nozzles to remove mineral deposits. Easy-turn spray dial. Adjustable ball connector to customize spray position. 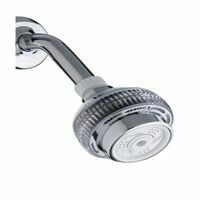 3-1/4" round shower head, advanced optiflow technology, easy clean nozzles, adjustable head, water pause toggle switch. Spray modes: Pulsating massage, Full body coverage, Full body/massage combination. Quick and easy shower filter replacement requires no special tools. Reduces chlorine taste and odor and scale for softer, cleaner skin and hair. Reduces sulphur odor. 2.5 gallon per minute flow rate. Certified to meet NSF standard 177 for filtered showerhead systems. Cartridge life: 6 months or 10,000 gallons. Fits Culligan showerhead WSH-C125 (SKU 2245793) and HSH-C135 (SKU 5277884). External lever easily adjusts spray from fast fine streams to a soft slower flow. Provides invigorating spray using 2.5 GPM. Includes the Power Boost Advantage, a series of brass restrictors which allows you to easily adjust the flow rate and performance of your shower, ensuring a great shower even in low-pressure. 1/2" Female connection, installs easily on all standard shower arms. Solid brass construction is polished and chrome plated for high luster appearance. 3-1/2" round shower head. 3 modes: full body coverage, concentrated center spray/massage, full body/massage combination, Features spray control ring, easy clean nozzles, removable flow regulator. Brass construction. Fits all standard 1/2" IPS shower arms. Features four adjustable water jets. Single wide spray. 2.5 GPM. 5 spray modes ranging from an invigorating pulsating massage to a powerful rinsing spray. Mode ring tab for easy transition between modes. Easy clean nozzles. 3.25" diameter head, advanced OptiFlow technology, anti-clog nozzles, 5 ft hose. Spray settings: full body, full body/massage, misting spray, pulsating massage, slow massage. Chrome finish. 5-spray/massaging shower head. With anti-clog nozzles to remove mineral deposits. Easy-turn spray dial. Adjustable ball connector to customize spray position. Glacier finish for a bright, clean white look, 3" diameter spray head, four-function combination spray for more variety, meets EPA WaterSense criteria to conserve water without sacrificing performance, limited lifetime warranty. 2.5 gpm. 3-1/2" round shower head. 3 modes: full body coverage, concentrated center spray/massage, full body/massage combination. Features 5 ft. vinyl hose, easy clean nozzles, spray control ring, removable flow regulator. Combines strong SaverShower spray with pressure compensating technology that provides consistent 1.9 GPM flow rate from 30 to 80 psi. Shower is a conical spray pattern of perfectly sized droplets for a forceful, invigorating and very wet feeling shower spray. Includes push button trickle valve. Saves over 20 percent more than other water saving showers, complies with all Water Sense guidelines for water and energy conservation. Made in the USA of chrome-plated solid brass and chrome plated, Installs easily with standard 1/2" female thread. 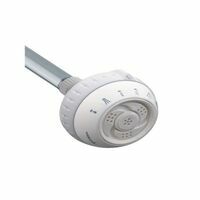 PowerSpray Showerhead, Series: Original Shower Massage, 2.5 gpm, 3-1/4 in Face Diameter, 1/2 in Connection, Full Body, 6 Spray Functions, White, White Four personalized shower settings: Pulse - steady pulsating spray. Turbo Pulse - powerful hyper massage. Spray Pulse - pulsating massage. Outside Spray - soft, body spray. 60 spray channels. 5-foot flexible hose. Up to 2800 pulses per minute at 80 PSI. Brass construction. Fits all standard 1/2" IPS shower arms. Features six adjustable water jets. Single wide spray. 2.5 GPM. 5-spray/massaging shower head, with anti-clog nozzles to remove mineral deposits. Easy-turn spray dial. Adjustable ball connector to customize spray position. 5-spray/massaging shower head, with anti-clog nozzles to remove mineral deposits. Easy-turn spray dial. Adjustable ball connector to customize spray position. 2.0 GPM flow rate. Spot resist brushed nickel five-function 4" diameter spray head. 2.0 gpm. Full spray shower handle has 50 separate rub clean nozzles for full body coverage spray and easy to use push button trickle valve. Soft rub lean nozzle prevents lime build-up. Push button cuts flow to a trickle to save water while lathering etc. Kit includes shower handle, 59" shower hose with chrome plated brass connecting couplings, and swivel arm bracket. Installs easily, no tools required. Touch cean nozzles. 60" flexible hose included. Fits on any standard shower arm 2.0 GPM flow rate. Touch clean nozzles. Fits on any standard shower arm. Chrome finish, 3-5/8" diameter, 2.5 gpm. 3-1/2" round shower head. 3 modes: full body coverage, concentrated center spray/massage, full body/massage combination. Features 5 ft. vinyl hose, easy clean nozzles, spray control ring, removable flow regulator. Brass construction, 2.5 GPM. Designed to fit all standard 1/2? shower arms. Pause feature redues the water to a trickle for water conservation. TouchClean soft, rubber spray holes allow easy removal of calcium and lime build-up. 5-spray/massaging hand shower. Ant-clog nozzles to remove mineral deposits, shower arm mount, tangle-free flexible hose, water effieint meets CALGreen standards, 10 inch spout leight. 3-1/4 round shower head, advanced optiflow technology, easy clean nozzles, 5 ft. faux metal hose, water pause toggle switch. Spray modes: Full body coverage, Pulsating massage, Full body/massage combination. Soft, rubber spray holes allows for easy removal of calcium and lime build-up. Provides soft champagne bubbles, hard shower spray, fast pulsating massage and two combination sprays. Chrome kit includes handle, 59? stainless steel Bungy shower hose that stretches to over 80?, and swivel arm bracket with Power Boost Advantage to ensure a good strong flow even in low pressure areas. White kit contains 59? Superflex hose. Installs easily, no tools required. 2.5 GPM max at 80 psi. 4" diameter spray head, meets EPA WaterSense criteria. 1.75 gpm. Chrome finish. 7" dia head, anti-clog nozzles. Drenching rainfall setting. Chrome finish. 3.25" diameter head, advanced OptiFlow technology, anti-clog nozzles, 5 ft hose. Spray settings: full body, full body/massage, misting spray, pulsating massage, slow massage. Chrome finish. 2.0 GPM flow rate. 5-spray/massaging hand shower. With anti-clog nozzles to remove mineral deposits. Shower arm mount for hands-free showering. Tangle-free, flexible hose. Sleek designed, oversized, 8-inch showerhead with downpour and power rinse settings. Over 100 spray channels for drenching, full-body coverage. 8-inch, patented flexible arm adjusts to infinite positions and height settings. 3-1/4" round shower head, spray control ring, 5 ft. vinyl hose, removable flow regulator, easy clean nozzles, advanced optiflow technology. Spray Modes: Full body coverage, Strong pulsating massage, Light massage, Misting, Full body/massage combination. HI/LO pan head shower easily raises and lowers. 3 ?? pan head provides invigorating wide spray and for full body coverage. 20? total swing pan swivels in every direction. Includes the Power Boost Advantage, a series of brass restrictors which allows you to easily adjust the flow rate and performance of your shower, ensuring a great shower even in low-pressure. Installs easily with standard 1/2? female thread. Spot resist brushed nickel five-function 4" diameter spray head. 2.0 gpm. Provides soft champagne bubbles, hard shower spray, fast pulsating massage and two combination sprays. Chrome kit includes handle, 59? stainless steel Bungy shower hose that stretches to over 80?, and swivel arm bracket with Power Boost Advantage to ensure a good strong flow even in low pressure areas. White kit contains 59? Superflex hose. Installs easily, no tools required. 2.5 GPM max at 80 psi. 6" round shower head, removable flow regulator, advanced OptFLOW technology, adjustable designer arm, full body rain spray. Maximum flow rate: 2.5 GPM 5-spray/massaging shower head. Finish stays cleaner longer with SpotShield technology. Pause feature reduces the water to a trickle, allowing you to conserve water while doing tasks such as lathering up or shaving your legs. Soft, rubber spray holes allow you to easily wipe away calcium and lime build-up from the spray face of your shower head with the touch of a finger. Spray settings include: Full Body, Full Spray with Massage, Massaging, Pause. 6" diameter head, advanced OptiFlow technology, anti-clog nozzles. Spray settings: drenching rain/massage, drenching rainfall, EcoRain, full body, power spray, pulsating massage, water saving trickle. Chrome finish. Anti-clog technology to remove mineral deposits, shower arm mount for hands-free showering, includes 72 in. tangle-free hose, easy-turn spray dial. Fits standard 1/2" shower fitting threads. Easy to install with included Teflon tape and a wrench. Chrome finish with ash gray shower face. 5 spray settings: full body spray, soft rain spray, invigorating pulse, full body spray/rain combo, and full body spray/pulse combo. Provides level 2 extra filtration through reduction of chlorine sulfur odors and scale. Bacteriostatic filter limits the passage or growth of bacteria that may already exist in the incoming water. Cartridge life: 6 months or 10,000 gallons. NSF tested and certified. Culligan replacement cartridge model: WHR-140 (SKU #7544281). PowerSpray Showerhead, Series: Original Shower Massage, 2.5 gpm, 3-1/4 in Face Diameter, 1/2 in Connection, Full Body, 5 Spray Functions, Chrome Plated, White 7-spray/massaging hand shower. Contemporary style with anti-clog technology to remove mineral deposits. Shower arm mount for hands-free showering. Includes 72 in. tangle-free flexible hose. Easy-turn spray dial. Ergonomic non-slip handle. Internal water-way and double check valve for peace of mind. 5-spray/massaging hand shower. Ant-clog nozzles to remove mineral deposits, shower arm mount, tangle-free flexible hose, water effieint meets CALGreen standards, 10 inch spout leight. 5 function showerhead. 2.0 GPM flow rate. 2.0 GPM flow rate. Chrome finish is highly reflective for a mirror-like look that works with any decorating style, generously sized 9" diameter rainshower for exceptional water coverage, one-function full spray, meets EPA WaterSense criteria to conserve water without sacrificing performance, limited lifetime warranty. 2.0 gpm. 4" diameter spray head handshower, five-function combination spray for more variety, meets EPA WaterSense criteria to conserve water without sacrificing performance, limited lifetime warranty. 2.0gpm. Operates as a hand shower, shower head or both at one time. 4-spray/massage hand shower features unique crossing spray settings. Integrated handshower docks securely into showerhead when not in use. 60" hose. Choose from five spray settings including a water-saving pause function. 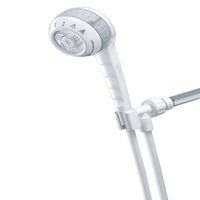 Easy turn dial for spray setting selection, adjustable shower arm mounting for hands-free showering. 72" flexible hose. 5" diameter head, advanced OptiFlow technology, anti-clog nozzle, 5 ft hose. Spray settings: circular massage, full body, misting spray, powerspray, water saving trickle. Chrome finish. Traditional style to revitalize any bath decor. Rub clean nozzles to remove mineral build-up, simply wet, rub and rinse away. Non-slip grip handle for a secure hold with wet slippery hands. Adjustable shower arm mount for hands-free showering. 3.25" diameter head, advanced OptiFlow technology, anti-clog nozzles, 5 ft hose. Spray settings: full body, full body/massage, misting spray, pulsating massage, slow massage. Chrome finish. Pause feature redues the water to a trickle for water conservation. TouchClean soft, rubber spray holes allow easy removal of calcium and lime build-up. Spray settings include: Full Body, Fast Massage, Full Spray with Massage, Massaging, Shampoo Rinsing, Shampoo Rinsing with Massage, Soft Drench, Soft Full. Includes 5 ft. metal hose, mounting bracket, and Teflon tape. Fits standard 1/2" shower fitting threads. Easy to install with included Teflon tape and a wrench. Chrome finish with ash grey shower face. 5 spray settings: full body spray, soft rain spray, invigorating pulse, full body spray/rain combo, and full body spray/pulse combo. Provides level 2 extra filtration through reduction of chlorine, sulfur odors, and scale. Bacteriostatic filter limits the passage or growth of bacteria that may already exist in the incoming water. Cartridge life: 6 months or 10,000 gallons. NSF tested and certified. Culligan replacement cartridge model: WHR-140 (SKU #7544281). Carded. 5 function showerhead. 2.0 GPM flow rate. PowerSpray Showerhead, Series: Original Shower Massage, 2.5 gpm, 3-1/4 in Face Diameter, 1/2 in Connection, Full Body, 5 Spray Functions, White, White Chrome finish is highly reflective for a mirror-like look that works with any decorating style, 5.5" diameter spray head handshower, six-function combination spray for more variety, limited lifetime warranty, it's a snap to use(tm). easy release and return with magnetix docking system, even with your eyes closed, customize your shower at the push of a button by clicking through six optimized settings, always docks facing forward to avoid exterior splashing outside your shower, features a kink-free metal hose that extends reach and flexibility. 2.0 gpm. Traditional style to revitalize any bath decor. Rub clean nozzles to remove mineral build-up, simply wet, rub and rinse away. Non-slip grip handle for a secure hold with wet slippery hands. Adjustable shower arm mount for hands-free showering. Chrome finish, 9" diameter head, seven-function combination. 2.5 gpm max. Spot resistant brushed nickel finish resists fingerprints and water spots for a cleaner looking bath, 5.5" diameter spray head handshower, magnetix technology features an innovative magnetic docking system, six-function combination spray for more variety, limited lifetime warranty, it's a snap to use(tm). easy release and return with magnetix(tm) docking system, even with you eyes closed, customize your shower at the push of a button by clicking through six optimized settings, always docks facing forward to avoid exterior splashing outside your shower, features a kink-free metal hose that extends reach and flexibility. 2.0 gpm. Diverter lever sets In2ition Two-in-One Shower to one of three options: Shower head and Hand shower, Shower head only, and Hand shower only.Pause feature reduces the water to a trickle, allowing you to conserve water while doing tasks such as lathering up or shaving your legs. TouchClean soft, rubber spray holes allow you to easily wipe away calcium and lime build-up from the spray face with the touch of a finger. Spray settings include: Full Body, Fast Massage, Full Spray with Massage, Massaging. 7-spray-massage hand shower (wide full spray, standard full spray, drenching full spray, massage spray, full spray with massage, energy saving spray, trickle), anti-clog nozzles for removal of mineral deposits, easy-turn lever to change sprays, 72" flexible vinyl hose, 29" contemporary wall bar, adjustable height hand shower mount, operates at 2.5 gpm. Blister packaging.